So real was the resurrection of Christ in history, that Christians proclaimed their faith in Christ could be validated or falsified on whether or not Jesus actually resurrected from the dead three days later (1 Corinthians 15:3-6, 14-15). It was the final test of the authenticity of Christ’s claims. Most of Jesus’ followers questioned and were doubtful of His claims, considering how He died by crucifixion at the hands of His enemies. Yet, three days later, it is recorded that many saw him, and on one occasion over 500 people witnessed His resurrection and met with Him before His ascension. For them, the credibility of this testimony before the world was simply a matter of His critics finding the dead body of Christ. They did not … because HE IS RISEN! (PMC) It is recorded: “They came to His tomb…and did not find the body of Jesus. The angels said to them…’Why do you seek the living among the dead? 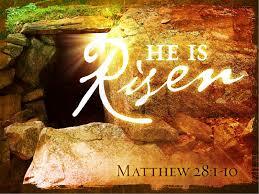 He is not here, He is risen, as He said he would’ ” (Luke 24:1-6; Matthew 28:1-6). as together we celebrate our Living Savior!